This is one of those plants that literally stopped me in traffic the first time I saw it. I was driving down Bee Cave’s Rd here in Austin, Texas about 10 years ago and just as I was passing by Barton Springs Nursery I did my usual “sneak a peek” as I drove by and some how for the first time I noticed an enormous plant with humongous red flower spikes. Now I swear I am usually a decent driver, but I nearly crashed my car spinning into the parking lot to see what the heck this plant was. When I first laid eyes on this Texas native jewel I knew it was love at first sight. 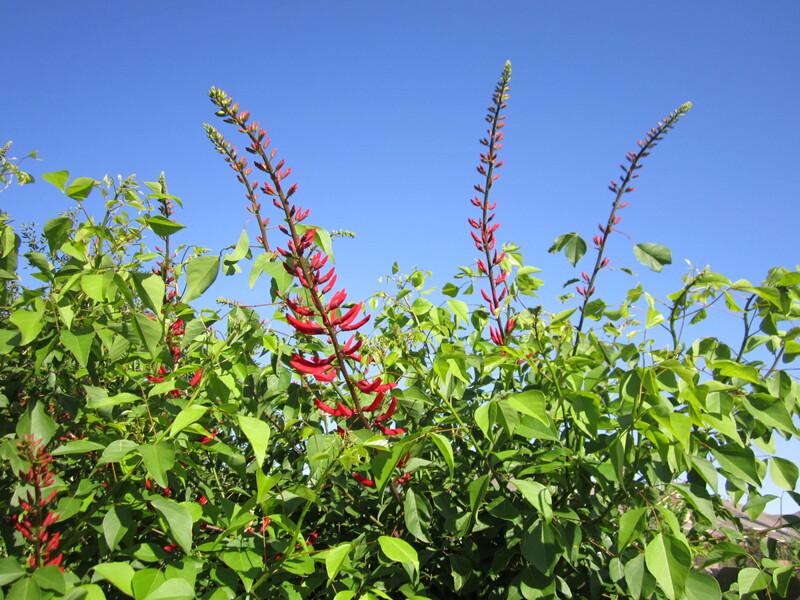 The Fireman’s Cap Coral Bean is a full sun to part sun plant that is a completely drought tolerant, deciduous perennial. It is a super fast grower once established and is an amazing specimen in the garden. 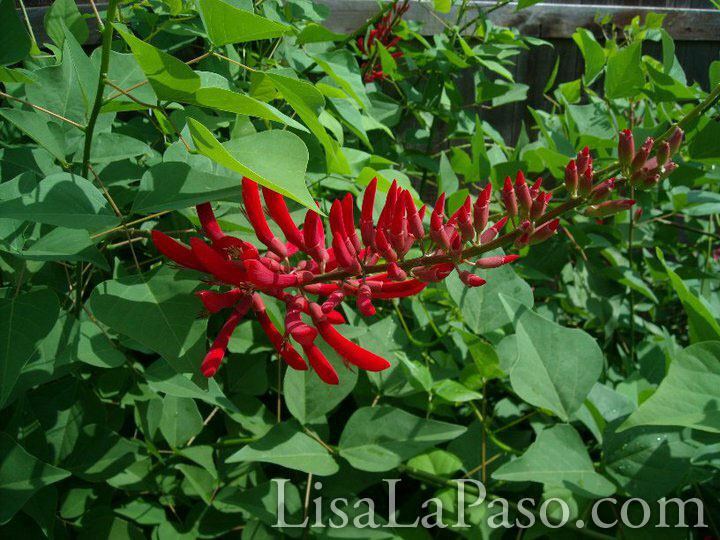 With its 2 ft long blood-red flower spikes and long tubular petals, it is also a huge hummingbird attractor and is hardy in zones 8-10. I cannot tell you the compliments I have gotten on this plant and how few people have ever seen one. It is striking in every way as it has really awesome bright green spaded leaves, and the base of it with each dormant season becomes a gnarled, twisted tree trunk that with each passing season becomes an even more interesting feature of the plant. Reaching up to 8’x8′ (taller further south of here) at maturity it definitely takes up some real estate, but this is absolutely one of those plants you want to make room for. One of my favorite plants to use in designs for so many obvious reasons. I like to use it as an impactful “boom” of color and textures and have been known to train them as a small tree (though South of here it can reach heights of 25′) but it is an excellent shrub as well and requires a lot less work if you just let it be. It will go completely dormant after the first hard freeze and will die back pretty hard requiring a bit of clean up, but it makes a come back as soon as it is warming up and goes to bloom immediately after and will continue to bloom until it freezes again. If you do attempt to train this plant as an under story tree (most large shrubs can be turned into a small tree) be sure you do so with caution as it is spikey and she means business. This plant is also toxic so if you have little ones prone to putting things in their mouth, you might choose to avoid this plant until they are older because it drops the long flower tubes onto the ground like a red carpet and can be a problem for animals and kiddos who like to eat what they see. The good news is that it is very deer and critter resistant for the same reasons. Obviously I am a huge fan of this plant, but if you are not convinced yet, or would just like to see it in action, check out my awesome video display! Now go get your garden on! Check my other videos on YouTube! is it too late in the year to try and plant this? If so, when would be the right time to get it in the ground. You are right, it is a beauty. Jennifer, if you are here in Austin, drop by Barton Springs Nursery on Bee Caves Rd. asap (they are there now & lovely) and get it in the ground. Be sure to give it extra attention and water daily as needed for the first couple of weeks, then deeply once or twice a week during the Summer and this plant will do beautifully for you. If you do not have time to nurture it as I have suggested, wait until the Fall to plant. ok, thanks Lisa! I work right around the corner from the nursery so I’ll be hitting them up asap! Good, I was just there and they look amazing! Tell them LL&D sent you! Have you ever had the leaves scald on this plant? Mine is 1.5 yrs old and gets full afternoon/evening sun, and a good portion of the leaves cooked when we jumped into the 100-108 temps last week. Still blooming, though. Thanks! Amy, last week was brutal and there was little acclimation time. The Fireman’s Cap is a sun to part shade plant and may suffer in a full late afternoon sun situation, but mine is about 7 years old in the same conditions and have not seen the same damage. Though many of my other perennials showed signs of significant stress so early in the season. Thanks! Glad to know it’s a survivor (it’ll just look a little rough this year…although there has been new growth/blooms since that first brutal week of full summer). Well I noticed that the sudden change in temps assaulted some of my otherwise hardy plants as well and I believe that the lack of acclimation played a part in that. They are hardy, and they are glorious and it will be just fine in time. I’ve been following you on FB lately and absolutely love ure garden and am impressed with your awesome variety of drought tolerant TX native plants! I am also now inclined to cut down the lawn area and go xeriscaping. I love gardening too, it makes me feel relaxed and happy! I’m absolutely gonna get this plant and the Datura moonflowers! I like the way uve turned this fireman’s cap plant into a tree, wud luv to get that look someday. Does it take years to get that look? And when the tree dies down every winter, will it regain itself in a tree form or back to the original shrub form? Hi Swapna, it does not hold up so well over a cold Winter, but because it is such an easy plant to trim, it is easy to get back into shape. In late Winter, early Spring months you choose 3 or 5 of the largest upright branches, treat them as the tree trunk and remove everything that grows below a certain height. The main part is clearing and keeping clear of all the low growing stems during this process. As the season continues, you will continue to remove any soft stems that return below your canopy line throughout the season, it will eventually slow the production below the canopy and the main production will be on top. Is this tree safe in yards with dogs? This plant is toxic which makes it a great deer resistant plant ,but not for dogs or children that may put it in their mouth.